You could be forgiven for assuming filters and facets for search are the same thing. Both exist to serve the same purpose: narrowing down search results by eliminating results or pages that don’t match selected criteria. While researching this post I found that most definitions for filters and facets online were wildly disparate and in some cases, completely incorrect. Most seemed to lump them together as the same thing (granted, they are quite similar) but there are noteworthy differences between the two. For clarity’s sake, we’re going to define them as follows: filters exclude results based on initial criteria and do not change with each search, while facets exclude using the properties from returned results and do change with each search. Filters are broad categories that are selected by the user to immediately eliminate pages or results on a site. They can be chosen before a search query has been entered, or immediately when presented with search results. Unlike facets, filters never change between searches. They will always be the same and don't adjust to reflect the search results, so it’s important that these are configured to be as general as possible. Filters can be displayed as tabs on a results page (think Google’s filters for Images, Shopping, Videos etc. ), but even navigational elements in web pages are technically filters; when clicking on each of these what is displayed will match what has been selected, and the rest is "filtered out". Because if you can’t explain it in emojis then it’s not worth explaining - a visual look at classifying foods using facets. Facets are a bit more specific - they are filters but pertain exclusively to the results from a search. As they relate specifically to your query, you'll never find facets that are irrelevant or inconsistent with what is displayed. You'll see that different facets are displayed depending on what your query is, and what the returned results are. Because multiple facets can be selected at once they are more efficient than selecting filters - this becomes apparent when searching through a high volume of pages. Google Images recently implemented facets that are automatically generated by artificial intelligence (AI). For example, a Google Image search for "samsung" will return the facets "gold", "galaxy s6 edge", "price", and "logo" - all relevant to the search query, and all predicted by AI. Pretty cool right? We've had great success using AI generated facets here at Sajari too - but more on this later. If you see a number in parentheses beside any characteristic in a results page, then this is a facet. This number matches how many search results each characteristic relates to. Bear in mind though that not all facets will follow this rule; this is just a visual clue. Don’t @ me if you find any anomalies. 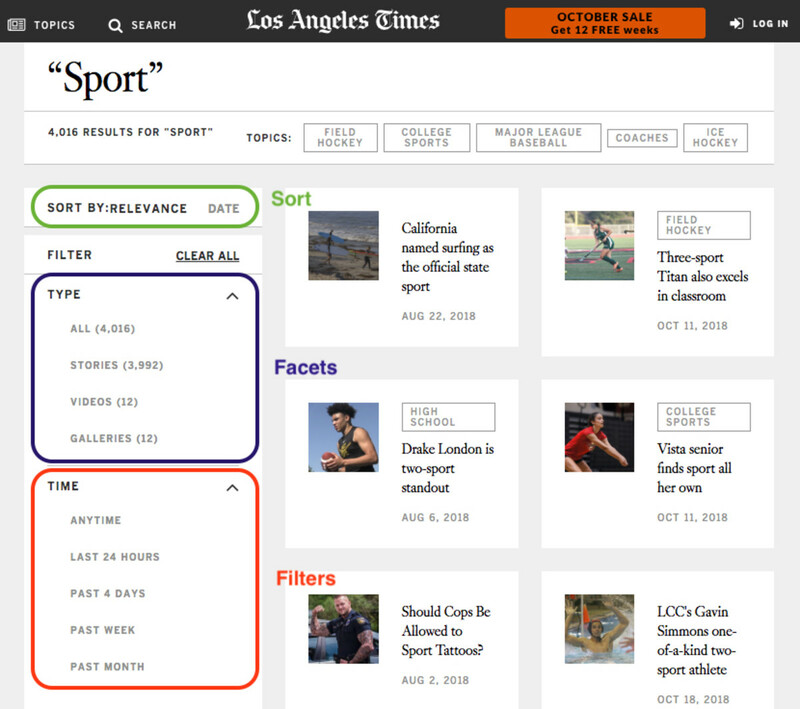 The Los Angeles Times are using both filters and facets for their search. It’s easy to see how many “Type” facets correspond to each query, and the option to filter by “Time” is using the published time for each page to filter. 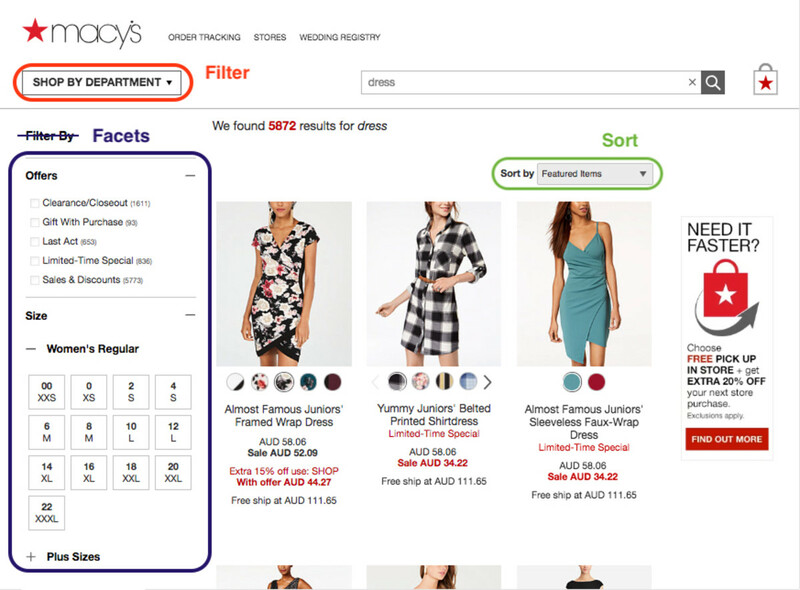 Macy's are using filters to shop by department in a drop-down menu. The facets have numbers in parentheses to show how many "Offers" match the query "dress", and also all the available sizes for what has been returned. Technically the "Filter By" option isn’t incorrect as facets are just more specific filters, but I’ve crossed this out to avoid confusion. 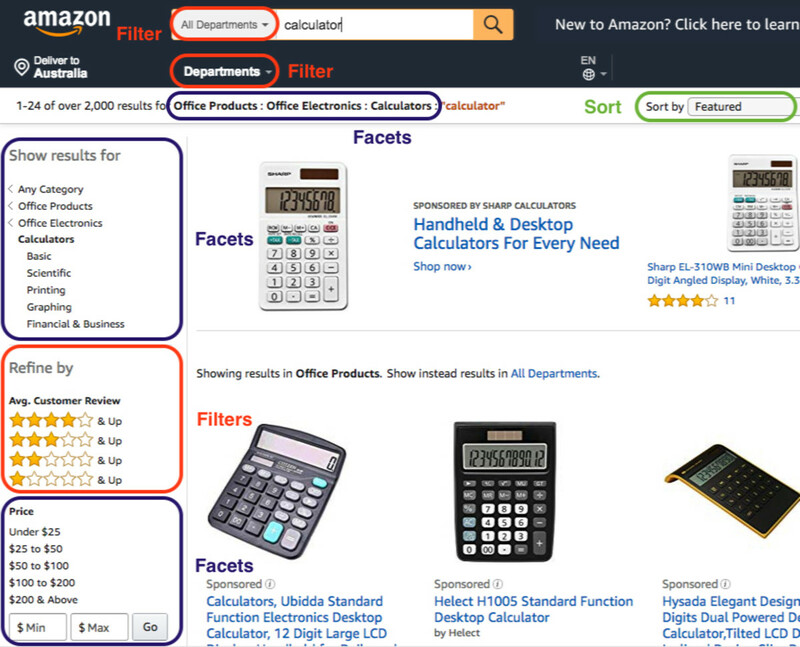 Amazon uses filters to eliminate via department in the drop-down menu. Filters are also used to eliminate results that don’t match a minimum customer review rating - both of these filters appear in every search. Amazon uses facets quite interestingly. Searching for “calculator” will automatically display products that are included under Office Products → Office Electronics → Calculators, but if this is too specific, you have the option to select the parent facet for a broader choice of products. Price as a facet is listed too. I've also highlighted the "Sort" functions on the above examples as a distinction. Sorting is different as no results are being eliminated - it's just a way to order results according to certain criteria e.g. from price low → high, most popular → least popular. Okay, I can see the difference now. 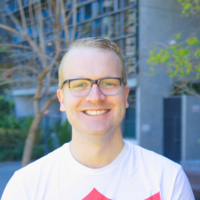 Should I use them for my site search? As we can see, the area where filters and facets are the most useful is ecommerce - where keywords used to reign supreme, facets and filters are fast becoming more practical for search. Of course, this isn't 100% true - using specific keywords when searching for things like brands is useful - but if you think about the last time you bought something online, it's highly likely you clicked on a filter and then narrowed down the results using facets to only show certain sizes or prices. It's much easier to find an object or item using filters and facets; it's nigh on impossible to describe an item in a few keywords to such a degree where only one item is returned (we're still working on it though). Research from Nielsen and Norman has confirmed the necessity of faceted search - when users are presented with too many choices, the product that they were looking for is missed and they will go elsewhere. Facets have become an integral part of shopping online and users will now complain when facets aren't available. These days, ecommerce sites without faceted search are the exception, rather than the rule. The standard facets for ecommerce are well known - price, size, color etc. - but facets are also useful whenever there is a large collection of content that has classifiable traits. If you were browsing through a collection of legal documents, it would be useful to facet by ruling date or jurisdiction. Similarly, if searching through an online music library facets like genre or song duration would be more useful. For all you UX nerds out there - here's a quick overview of Hick's law from Nielsen & Norman. TL;DW: Hick's law states that users can easily scan a long list of facets as long as they are in order (usually alphabetical) and are all familiar. Great, they sound useful. How can I start using these though? 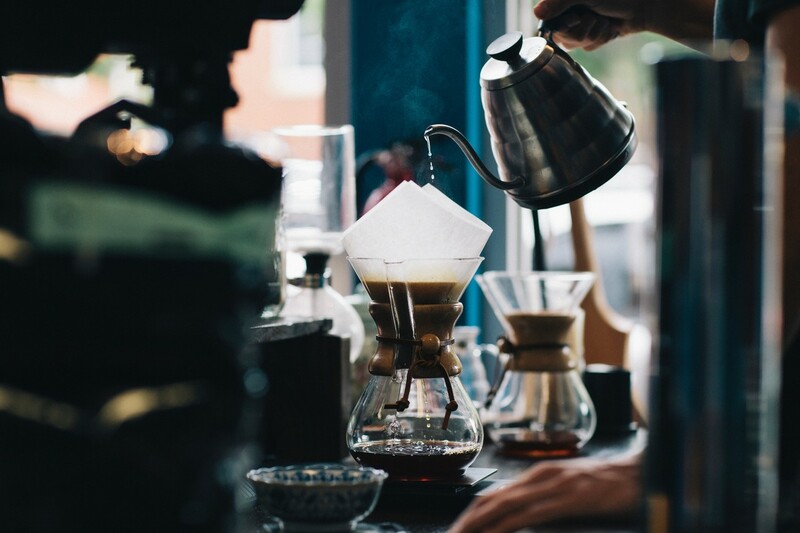 Setting up filters and facets may sound daunting, but as long as each page has a similar structure filters and facets are quite easy to get up and running. Filters are often created using a site’s URL structure; this can be a straightforward way to allow users to quickly narrow down results, but it’s not a reliable method for creating rich facets to allow users to sort through complex and varied information. At Sajari we're focused on giving you the tools to build your own search experiences, customized to your own business. We’ve made setting up your own customized filters and facets as easy as possible. You can simply wrap any HTML element in Sajari tags to tell our crawler to store the element’s variables - these variables can then be used to create filters and facets in your search interfaces. Sajari can also use artificial intelligence to classify information and generate facets automatically if you have a large swathe of unstructured data. AI can sort content into mathematical clusters that can be labeled, and any new content added to your site will be tagged with these labels. I won't go into the details here, but check out our blog on machine learning to get an overview of how we're using these breakthroughs at Sajari. Filters eliminate results or pages using initial criteria and never change. Facets are used to refine search results using their characteristics and will change depending on the results. Both are now expectations a user has when searching - if you're not using filters and facets, you’re likely to create a frustrating search experience which could lose you sales and customers. If you need any more clarification about filters and facets or how we can work with you to create a seamless search experience, feel free to reach out to us @Sajari or on Sajari.com.